Five Gables i Montego Bay, Jamaica: Reservér nu! Cash balance is due on arrival, thank you. Five Gables is a cozy Villa with a private pool overlooking the garden, filled with tropical fruit trees. With a large Veranda and view of the Caribbean Sea, its the perfect place to kick back and make yourself at home. Ironshore is a quiet suburb of Montego Bay, popular for villas and vacation homes. It is located a 5 minute drive from groceries, restaurants and other shopping, 10 minutes from the airport and 15 minutes from downtown MoBay. The popular Gloucester Avenue, or 'Hip Strip' with great beaches, restaurants and entertainment is located about 12 minutes away. We have 3 room types: a 6 bed mixed dorm, a single room with a full size bed, and a double room with a queen size bed and a day bed. We also have a Great room (common room), kitchen, 3 bathrooms, laundry room with washing machine, veranda and a swimming pool. The kitchen has a refrigerator, stove, oven, microwave, and a coffee maker. The mixed dorm is spacious and has 3 bunks with 6 twin size beds. There is a ceiling fan and standing fan but the sea breeze through the full height windows normally does the trick and keeps the room cool on its own. There is also an adjacent bathroom with a toilet, sink and a bathtub with hot water. The cost of the mixed dorm is $23 per person per night. The single room has a full size bed and easily accommodates 1 person. There is a ceiling fan and a standing fan. There is an adjacent bathroom with a toilet, sink and a shower. The cost of the single room is $45 per night. The double room is majestic with its antique furniture, view of the swimming pool and the Caribbean Sea, and its spacious layout. It has a queen size bed and a full size day bed. This room measures 28 feet by 16 feet (8.5 meters by 5 meters) which includes the private bathroom and closet. The private bathroom has a toilet, sink and bathtub with hot water. There are full height windows, a ceiling fan and a standing fan. The cost of this room is $35 per person per night or $70 for the whole room. Free Wifi, washing machine (US$5, J$500), towels, linen, free parking, lockable front gate, swimming pool, radio, book exchange, common room, airport transfers, fans. Arrival: Take an airport taxi to Five Gables, which should cost around US$20. Depending on availability, we may be able to arrange a pick up from the airport. We also can arrange transportation for you back to the airport for your departure. Local runs: We have relationships with several taxis that can take you wherever you need to go such as to the nearby Blue Diamond and Whitter Village shopping plaza (for food, supplies, ATM, Cambio, Western Union, and local SIM card shop), to the beaches or downtown Montego Bay for reasonable prices. Trips to nearby towns: With advance notice, we can also arrange transportation for excursions to nearby towns such as Negril, Falmouth and Ocho Rios. Tours of local places of interest and off-the-beaten-trail spots can be arranged with our local Montego Bay residents and friends of Five Gables. The property is well lit at nights and all the windows and doors are grilled for an additional layer of protection. We have many fruit trees that range from Ackee, Breadfruit, Soursop, June plum, aloe, Pomegranate, Orange, Jamaican apple, Julie mango, East Indian mango, Almond, and of course fresh limes (perfect for that rum and coke or the house favorite: rum and coconut water). Feel free to pick and enjoy as many fruits as you like. For the adventurous types, who may try cooking ackee, please make sure the ackee pods are open before they are picked. Five Gables was built by North American Snowbirds in the 1960s as a private villa for winter escapes to the tropics. It’s design is authentic post colonial Caribbean architecture, with a large Great room (common room) with high vaulted ceilings and large bedrooms. The house still has the original wood shingle roof and the original terrazzo tile floors. There is a large Verandah that overlooks the swimming pool and faces the Caribbean Sea. Throughout the house, there are plenty of windows that invite the sea breeze in keeping the interior cool and comfortable. Five Gables is situated in one of the best neighborhoods in Montego Bay and is now a hostel for you to enjoy. 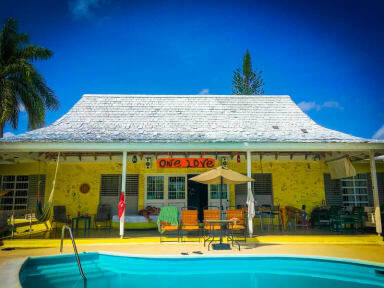 Definitely the best hostel in all of Jamaica. The atmosphere is just amazing, Ian is so nice, and I definitely had the most relaxing time here.